Nelson-Creston MLA Michelle Mungall joined with fellow NDP member George Heyman to announce new legislation that will help reduce climate pollution by phasing out gas-powered light-duty vehicles and making zero-emission vehicles (ZEV) more available and affordable for British Columbians. If passed, the zero emission vehicles act will require the sale of all new light-duty cars and trucks be zero-emission vehicles by 2040. 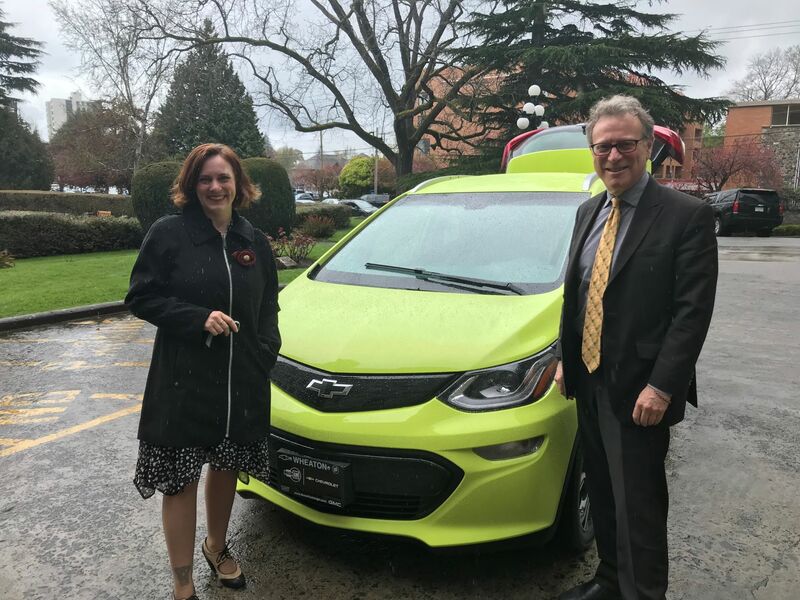 “British Columbians are eager to make the switch to zero-emission vehicles, but price and availability can be barriers,” Mungall, Minister of Energy, Mines and Petroleum Resources, said during the announcement Wednesday in Victoria. Mungall said the legislation will require all new light-duty vehicles to be zero-emission vehicles by 2040. This target will be met using a phased-in approach, with 10% of new light-duty vehicle sales by 2025, 30% by 2030 and 100% by 2040. The annual automaker requirements will start for the model year of 2020. “We know that British Columbians want clean-energy vehicles to be more affordable and more accessible,’ Heyman, Minister of Environment and Climate Change Strategy, explained. “The legislation will make it easier for everyone in our province to choose a clean-energy vehicle as their next purchase, supporting our long-term work to build a cleaner future, while dramatically reducing transportation and maintenance costs for British Columbians. The zero emission vehicles act is based on the legislation already in place in Quebec and California and was informed by consultation with British Columbians, manufacturers and key stakeholders. CleanBC invests $902 million over three years for programs, making B.C. the leader in Canada in tackling climate change and protecting the province’s clean air, land and water. CleanBC is a shared priority between government and the BC Green Party caucus, and supports a commitment in the Confidence and Supply Agreement to implement climate action to meet B.C.’s targets. The legislation applies to new vehicles for retail sale or lease, with annual requirements to start for the model year of 2020.
up to $6,000 for a hydrogen fuel-cell vehicle. B.C. already has the highest per capita adoption of zero-emission vehicles in Canada, with over 17,000 ZEVs on the road, averaging 4% of new light-duty vehicle sales in 2018, and one of the largest public charging and hydrogen fuelling networks. British Columbians who purchase electric vehicles typically save about 75% on their fuel and maintenance costs, which adds up to about $1,500 per year.